Undoubtedly, one of the first things you learn in aquarium fishkeeping is the correct pH for your saltwater aquarium, which ranges from 8.0 to 8.5. Also, you most likely learned that maintaining stable pH levels is as important as adjusting to the correct pH levels. In addition, since rapid or frequent changes in pH is detrimental to the health of your aquarium’s inhabitants. This concern is where alkalinity comes in. Thus, in this article, we’ll talk about alkalinity, how it stabilizes pH levels in the water and how to raise alkalinity in reef water. Alternatively, you can skip to the Raising Alkalinity section if you’re already familiar with the water chemistry involved. Otherwise, read on. Water with adequate alkalinity levels prevents it from turning acidic despite the presence of acid-causing matter as well as acid-producing marine life. Consequently, this high buffering capacity stabilizes the water’s pH. On the other hand, tank water with low alkalinity levels eventually turns acid which results in rapid and deadly pH swings. Furthermore,it goes without saying that such unstable pH would be fatal to you aquarium’s inhabitants. You can measure alkalinity levels or buffer capacity through the presence of carbonates and bicarbonates in water. Experts refer to this measurement as carbonate hardness or “KH.” Hence, aquarists and fishkeeping experts may use “alkalinity,” “buffering capacity,” as well as “carbonate hardness” interchangeably. The most common unit that aquarists use is degrees carbonate hardness or dkH. Despite its name, dKH refers to the total alkalinity of your tank water instead of the water’s hardness, at least in the context of aquarium keeping. One unit of dKH is equivalent to 17.86 ppm or 0.36 meq/L. Another unit that is common among hobbyists and water test kits is ppm CaCO3 or parts per million of calcium carbonate, or simply ppm. One ppm is equivalent to 0.06 dKH, or 0.02 meq/L. Probably the most scientific approach to gauging alkalinity is via milliequivalents per liter or meq/L. This unit is most common as a way to measure compounds in biological fluids such as blood or your reef water. One unit of meq/L is equivalent to 2.8 dkH, or 50 ppm. Consequently, you’ll be needing a tool to measure the alkalinity of your tank water, if you haven’t already bought one. 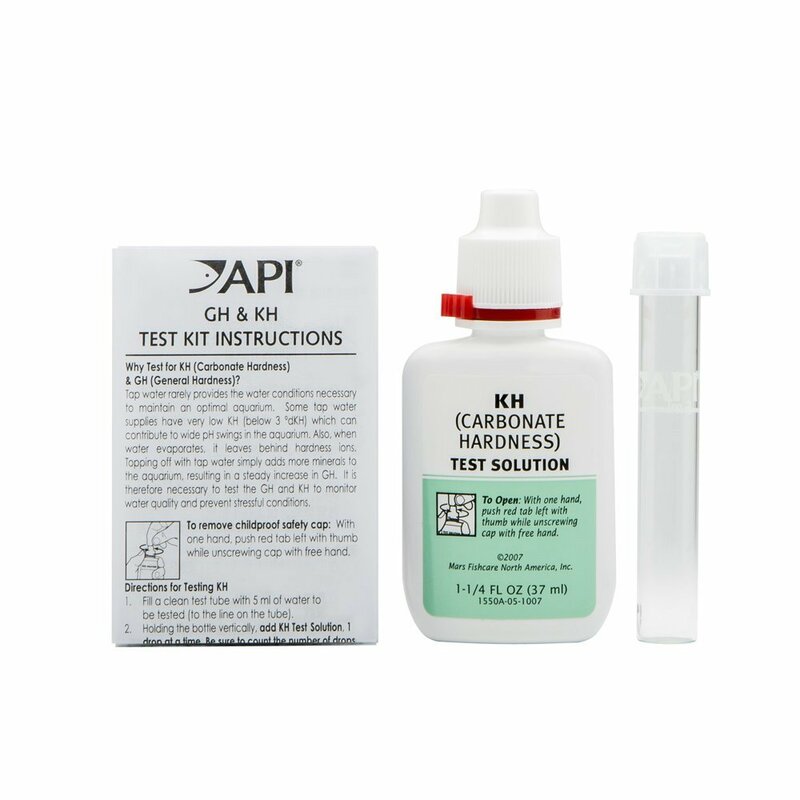 Typically, you may use a KH water test kit like this one from API. Worried about all the maths and conversions you’ll need to do between the units? Don’t be. Here’s a handy carbonate hardness calculator to help you with that. So, how would you determine if your reef tank has alkalinity problems? For saltwater tanks, experts recommend the following KH measurements for stable pH and an overall healthy aquarium. If your reef tank falls within these ranges, you won’t need to make any adjustments to the water chemistry in your tank. You should take note that a tank with 11 dkH is not necessarily better than a tank with nine dKH nor would I advise you to keep it at very high levels desperately. Sufficient KH will ultimately depend on your particular tank’s needs. However, a measurement somewhere in the middle of this ranges will be fine. However, if several test kits show that you are below this ranges, then you’ll need to take quick and decisive action. If you find that your tank falls below the recommended ranges or you would simply like to increase alkalinity for particular tank conditions, thenyou will need an alkalinity supplement or additive. There are a variety of possible supplements or additives to choose from, such as Kalkwasser (limewater), baking soda, washing soda and many specialized aquarium products. For this article, we’ll be using the Reef Builder from Seachem to raise alkalinity. These additives are ultimately chemicals. Hence, always remember to take every precaution when adding them to your reef tank. Also, research the particular additive before attempting any water chemistry correction or consult an expert. Also, an important guideline is to add additives in small increments while routinely monitoring your tank’s water parameters. This procedure will make sure your aquarium inhabitants do not suffer any shock or trauma from the sudden changes to the water conditions. If you don’t have one yet, a reef master test kit will be a great investment. With this kit, you’ll be able to regularly check your reef tanks calcium, KH, phosphate, and nitrate levels. Using your KH test kit, measure your reef tank’s current alkalinity levels, then determine the KH you would like to reach. ​For instance, if you’re raising your KH levels from 2 meq/L to 4 meq/L in a 40-gallon tank, then you’ll need a total of 25.5g (4.2 tsp). Never dose all at once. Following the procedure in step two, it’ll take around four weeks to raise your water’s alkalinity to 4 meq/L. For further calculations or if you prefer to use other additives, you can consult this reef chemistry calculator. Again, always remember to research and take precautions before attempting to raise KH levels with any additive. Monitor pH levels after every dose while ensuring no immediate pH changes of +/-0.20. Check KH levels every two weeks. After reaching desired alkalinity levels, use the Seachem Reef Builder as required to maintain your reef tank’s KH levels. Water chemistry can be quite daunting to the uninitiated especially when it comes to critical parameters such as alkalinity and pH. However, with a little background and a basic understanding of its processes, you can ensure that your reef tank is in its best shape and your fish at their healthiest. The Best ViparSpectra LED Review: Its Top 3 Features And More!